Hello all!! 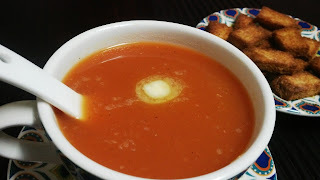 Today I am going to share Tomato soup recipe. Tomato soup is a delicious and healthy soup consisting mainly of tomatoes, blended with ginger or garlic along with some herbs and spices. It is one of the popular soups among adults and can be easily found in every restaurant's menu. It is raining cats and dogs in Hyderabad. Lovely weather!! The monsoon winds instantly makes me crave for either a hot cup of coffee or a steaming bowl of soup. I decided to prepare the most liked soup of all times "Tomato Soup". The hot steaming bowl of soup combines the tanginess of fresh tomatoes, ginger and black pepper soothing the mind and body. 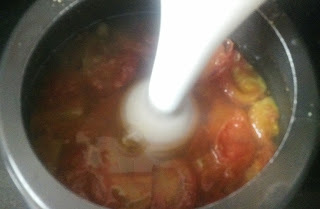 Below I have share a simple and fuss free tomato soup recipe and tried my best to keep it as healthy as possible. 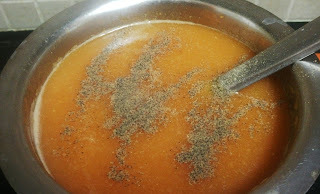 It is especially good to consume in winters and can even be given to kids as it is a healthy soup recipe. Hope you would like it. Wash the tomatoes thoroughly. 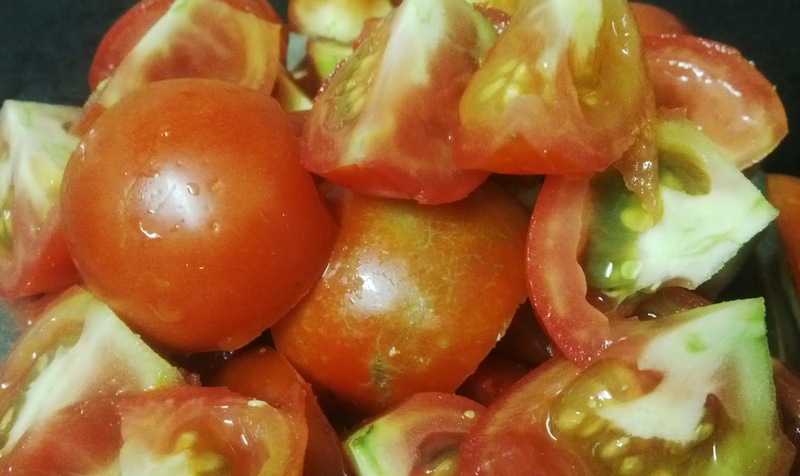 Chop off the upper part of the tomatoes and then cut them into four pieces lengthwise. Add these tomatoes into a pressure cooker. Add chopped ginger to it. 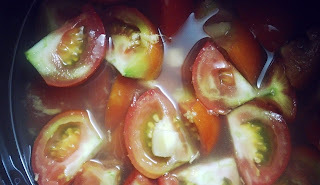 Fill it up with water such that all the tomatoes are submerged completely. Let the cooker whistle at least twice before switching off the flame. Once all the pressure from the cooker is released and the tomatoes have cooled down, blend them well in a blender or mixer. 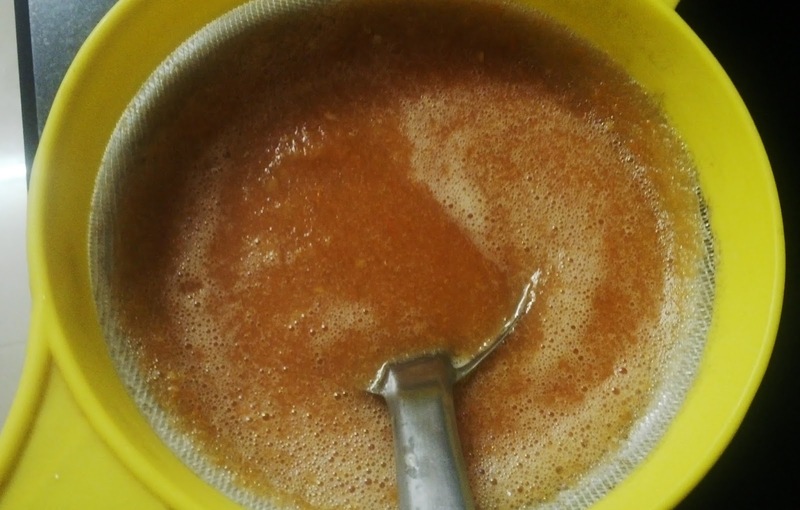 Sieve the blended tomatoes using a strainer. Step5: To the liquid part, add salt, sugar and black pepper. Stir well. Cook it on low flame for 10-15 minutes with intermittent stirring till it reaches the desired thickness. Delicious and healthy Tomato Soup is ready!! I have also prepared the bread croutons with the soup using Air Fryer. For the procedure click here. Otherwise, you can prepare the croutons by cutting the cubes out of bread and deep/shallow frying.